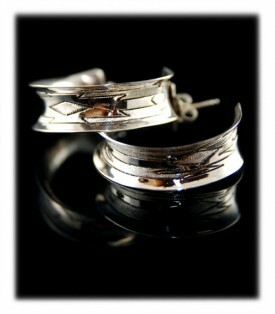 Sterling Silver Earrings by Durango Silver Co. Throughout time sterling silver earrings have been one of the most popular forms of personal adornment. Handmade earrings have been worn since the caveman times, however sterling silver earrings are a newer form of adornment. Prior to humans having the ability to smelt metal, earrings were made of bone, shell, stone and other things. Today earrings are handmade from all types of precious metal, non precious metal, gemstones, bone, glass and even plastics. There are several style of sterling silver earrings such as hoop earrings, stud earrings, and dangle earrings. Sterling Silver Earrings will be in style for eternity! Sterling Silver Earrings are one of the most popular types of Jewelry for a women and men world wide. 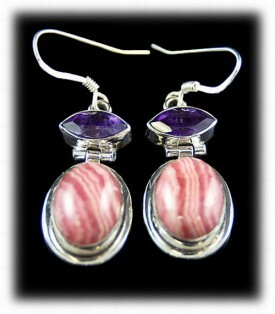 Durango Silver Company produces many types of handmade Sterling Silver Earrings with many types of gemstones. 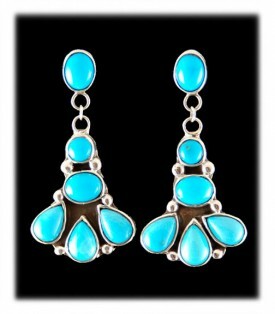 Turquoise Sterling Silver Earrings are one of our specialties as we are from the Southwest and have been collecting and mining Turquoise for more than 40 years. 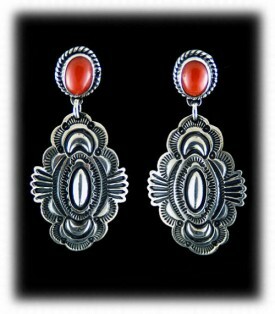 We make Southwestern style Sterling Silver Earrings and also deal in Native American Indian Sterling Silver Earrings. Above are two different pairs of Sterling Silver Earrings produced by Durango Silver Company. The pair of handmade silver earrings on the left are what we consider a contemporary Silver Earring style that focuses on the gemstone. This particular pair of Turquoise Sterling Silver Earrings have outstanding natural American Turquoise from Arizona in multiple sterling silver bezel settings. This type of Turquoise is the most popular world wide, in fact, Turquoise is one of the most popular stones used in sterling silver earrings worldwide. Our company produces some of the finest quality Turquoise Silver Jewelry coming out of the Southwest today, we invite you to check out what we have to offer by clicking on the Earrings button to the left of this page. Above and to the right is another pair of Sterling Silver Earrings with natural Rainbow Moonstone that were produced by our company. This pair of earrings demonstrates another of the most popular styles of sterling silver earrings which is the post earring or stud earring. 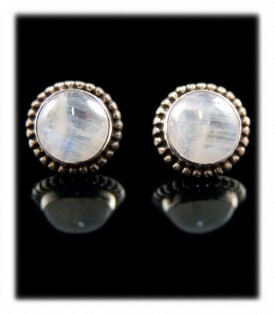 This pair of earrings feature two Moonstone round cabochons that are surrounded by beaded wire. Stud Style Sterling Silver Earrings may even be the most popular style of sterling silver earrings today, and defiantly the most versatile. Above are two pair of Sterling Silver Earrings that can be found on DurangoSilver.com, they are good examples of modern day sterling silver post earrings. The pair of multi color cluster earrings on the left were made by a Navajo Artist and feature Sleeping Beauty Turquoise, Red Coral and two colors of Spiny Oyster Shell along with Silver Beads, they were handmade with 100% Sterling Silver. These type of post earrings are very fun to wear and add a lot of color to any outfit. 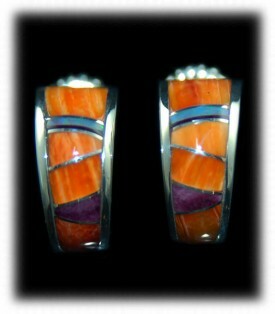 To the right is a great pair of multi colored Silver Gemstone Earrings set in Sterling Silver. 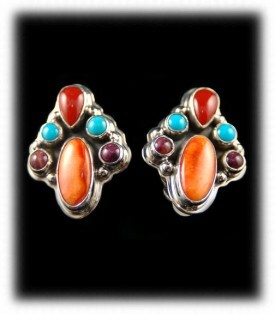 This Southwestern Sterling Silver Earring style is very attractive when worn. We often refer to this style as Zuni Inlay Jewelry however a lot of the inlay sterling silver earrings being made today are made by Navajo artists. We have many different shapes and configurations of gemstone types in this style of Sterling Silver Earrings, check it out. To the left is a pair of Inlaid Sterling Silver Earrings - This type of inlay stone work is very popular in Southwestern style Silver Jewelry as well as Southwestern style Silver Earrings. This particular pair of earrings were Native American Handmade and inlaid with Spiny Oyster Shell, Turquoise, Lapis and Sugilite. They are half hoop Sterling Silver Earrings. To the right is a beautiful pair of Sterling Silver Earrings in a contemporary style with Rhodocrosite and Amethyst Gemstones, they are set into a beautiful pair of handmade Sterling Silver Earrings. Durango Silver Company makes and handles many different types of gemstone earrings created in Sterling Silver from Native American Artisans, as well as contemporary artists throughout our area. Durango Silver Company is known for producing some of the most unique Sterling Silver Earrings from the American Southwest. We pride ourselves in producing and handling quality Handmade Sterling Silver Earrings that are distinctive and quality made. We have collected and mined Turquoise for over 40 years so Turquoise is one of the premier gemstones we use in our Sterling Silver Earrings as well as the Sterling Silver Jewelry that we produce. We also use many other gemstones in our Jewelry, you can count on all of these to be high quality and authentic as well. To the left is a quality pair of Navajo Handmade Sterling Silver Earrings that consist of hand stamped Navajo style concho's that dangle from a Mediterranean Coral gemstone setting. We have been handling Navajo Silver Jewelry and Navajo Silver Earrings for decades and always have many great pairs on our website as well as in our Trading Post located in Durango, Colorado USA. 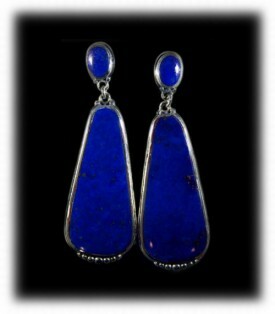 To the right is a unique pair of Lapis Dangle Sterling Silver Earrings which are an exclusive to our company. This pair of Silver Dangle Earrings are exceptionally large, about 2" long, yet, they are still light enough to wear all day long as we carefully cut these gemstones very thin to keep the weight to a minimum. We also cut out the back side of the earrings to make them even lighter. Above are two different types of Turquoise Silver Earrings - To the left is a pair of Contemporary Sterling Silver Earrings with good sized Tibetan Turquoise Gemstones. Durango Silver tries hard to always have Tibetan Turquoise in their Silver Jewelry as we truly believe Turquoise has spiritual as well as medicinal powers and Tibetan Turquoise has been worshiped by the Tibetan people for thousands of years. If you were to go to Tibet today, you would realize Turquoise is a very important gemstone in each and every life in Tibet, Tibetan people worship Turquoise and the entire Tibetan society believes it has spiritual powers. 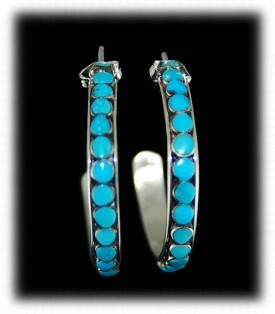 To the right is a pair of Silver Hoop Earrings with Sleeping Beauty Turquoise made by the Zuni Indians of New Mexico. Zuni Sterling Silver Earrings are a favorite by our customers here at Durango Silver Company, they are beautiful, lightweight and very intricate. 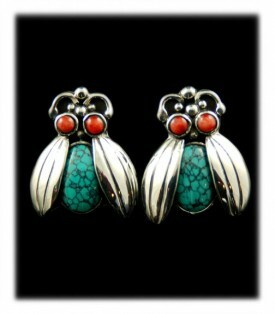 The Zuni's do fine Silverwork and pay close attention to detail. 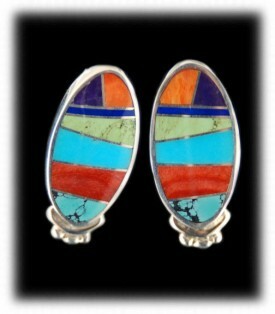 The Zuni Indians are also wonderful at their lapidary work and are known worldwide for their superb craftsmanship. We always have a good selection of Zuni Sterling Silver Earrings on hand, we appreciate and handle all types of Zuni Sterling Silver Earrings. 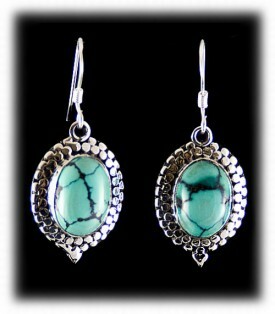 Above are two beautiful pair of Sterling Silver Gemstone Earrings available from Durango Silver Company. To the left is a pair of beautiful lost wax style Sterling Silver Earrings that are colorful, special and affordable. 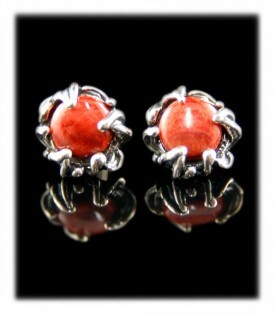 This pair of Italian Coral and Sterling Silver Earrings were American handmade in Durango, Colorado and are pieces of jewelry art! Our company promotes "Made in the USA" and is very proud to be able to say that our Silver Jewelry is made in the United States of America! To the right is a very nice pair of Sterling Silver Stud Earrings with natural Ox Blood Coral and Spiderweb Tibetan Turquoise gemstones. This pair of Silver and gemstone stud earrings were a limited addition to our company as they were a one of a kind style and we made a limited amount of this style as the time involved creating these handmade Sterling Silver Earrings was intense. We often produce unique designs on a limited basis and never produce that particular Silver Earring again, we are known for this! We hope you have gained some useful knowledge from our Sterling Silver Earrings educational presentation page. We invite you to learn more about Silver Jewelry and Turquoise Jewelry by following the links in our Learning Center which has many other informational pages that we have written on topics related to Southwestern Silver Jewelry. In addition, we would like to invite you to join our E-Mail Newsletter - about once every other month we send out a Newsletter to inform our members of what's happening with Durango Silver Company, new products, specials for our members and more. We also have a monthly drawing from our members to Giveaway free Turquoise Jewelry from our company. Please take a moment to become one of our friends and future winners in our giveaway by signing in below. We hope you will think of Durango Silver Company when you are ready to look for you next pair of Sterling Silver Earrings.